I am posting next week's contribution to the sewing circle today already, since I'd also like to be a part of the fantastic site Project Run and Play's link party about kids' clothes. I made a cute beach robe for baby I, from a pattern by Dana made it. Pattern found here. The robe is made by a very cheap Ikea beach towel, some bias tape, and cotton fabric for the lining (which I like the best, I LOVE the lining). It was my first time ever sewing in terry cloth, and I still find tiny pieces of light blue terry cloth everywhere. Well, Dana warned me about that, so I was prepared. This robe suits 7 month old baby I just fine. It is quite short, but that's actually rather practical. We use it when we go swimming every week, and there is always someone admiring it. 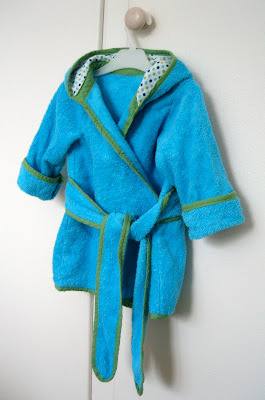 Next in line is a matching robe for A in green fabric with blue bias tape. The pattern only goes to 4T, but since A is quite thin I'm simply going to make it longer and use the 4T pattern. More on that as well as pictures in a few weeks. The kids will look fabulous in these at the beach this summer! Summary in Swedish: Jag har sytt en badrock till sju månader gamla I av en Ikea-handduk. Mönstret hittade jag här. 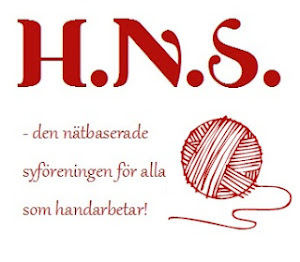 Den är hemskt söt, och jag är löjligt förtjust i det prickiga fodret. I LOVE this robe...and the colors are so cute together! Love your blog!